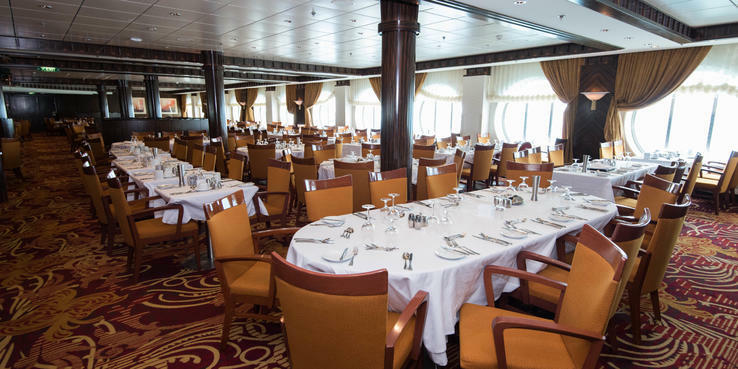 Reflections, the ship's main dining room, spans two decks. The focal point of its decor is a cascading waterfall -- a bit of an exotic touch. For dinner, passengers can choose between assigned early (6 p.m.) or late (8:30 p.m.) dining, or opt for RCI's My Time Dining, in which you pick a preferred mealtime (anytime between 6 and 9:30 p.m.), but can change your reservations on a daily basis or simply walk in when you're hungry. (Note: Those opting for My Time Dining will need to pre-pay gratuities.) Otherwise the restaurant operates under an "open seating" policy for breakfast and lunch. Tables for two were at a premium. The food was delicious and offered a nice variety each night, including alternate menu items for those on restricted diets (fellow passengers raved about the sugar-free key lime pie!). At dinner time in Reflections, lines tended to form in the entryways before each seating began; We'd recommend arriving about five minutes after your seating time to avoid the crowds. Windjammer, on Deck 11, is the ship's buffet and is the perfect place to grab breakfast or lunch pre-shore excursion, when you don't want to devote hours to Reflections. There are themed stations (hot food, deli fare, pasta, salads, etc.) and, as with its Radiance-class siblings, the innovative design of the buffet area - lots of stations rather than one long line - eliminates overcrowding. In the Windjammer you'll find a mini-type bar that sells wine, beer and sodas; lemonade, ice tea, coffee and water are offered on a complementary basis. If, at peak hours, you find it hard to nab a table at Windjammer head for the back of the Cafe, where there's a delightful (and oft-undiscovered) outdoor seating area that's covered. Specialty dining is available in Chops, an upscale steakhouse for an additional fee of $30 per person, though it's worth the charge and a nice change from Reflections. Passengers cited Chops as having the largest baked potatoes they'd ever seen, along with crab cakes that were to die for. Regardless of the ship's official dress code, guests who eat at Chops Grille are asked to go as "smart casual." Royal Caribbean's room service options are available around the clock via 24-hour menus that offer a range of snacks and sandwiches. At breakfast, continental dishes, along with a handful of egg entrees, are available both in cabins and suites. Only the Continental breakfast is free of charge; all other orders carry a $7.95 surcharge.